Resident advisers, orientation leaders and Summer Vestibule Program counselors had dinner at Liberty Hill on Saturday with RIT President David Munson as they prepare to welcome 2,800 first-year students who are moving in on Tuesday. Rochester Institute of Technology this week welcomes its most diverse freshman class of about 2,800 students. That gives a total approximate enrollment approaching 19,000 students for the first time at RIT, including about 2,200 students at its international campuses. The class has strong academic credentials with a mean high school grade point average of 92. Although official enrollment figures won’t be confirmed until mid-September, preliminary data indicate that 29 percent of the first-year class self-identified as people of color, up from nearly 27 percent last year. Deaf and hard-of-hearing students make up 8.5 percent of the new class. Approximately 73 percent of the total incoming class will be entering STEM majors. About 69 percent of underrepresented minority students and 56 percent of female students will enter STEM programs, said Jim Miller, senior vice president for Enrollment Management and Career Services. RIT is also welcoming 560 transfer students from other colleges and universities, and about 1,000 students starting graduate degrees. Miller said applications this year increased three percent to a record of more than 20,500. This year, 53 percent of the freshman class comes from outside New York state, and 7 percent comes from outside the United States, with the largest international groups from China, India, Canada, South Korea and Nigeria. New students will move into their residence halls starting at 8:30 a.m. Tuesday. From 3 to 6 p.m., a Tiger welcome picnic is planned outside the Gene Polisseni Center. Also Tuesday, the popular Goodbye, Goodbuy! sale runs from 10 a.m. to 5 p.m. in the Clark Gym, offering literally tons of items at thrift store prices collected from students who moved out in the spring. Items include clothing, furniture, appliances, school supplies, electronics and more. The sale will continue through the week. 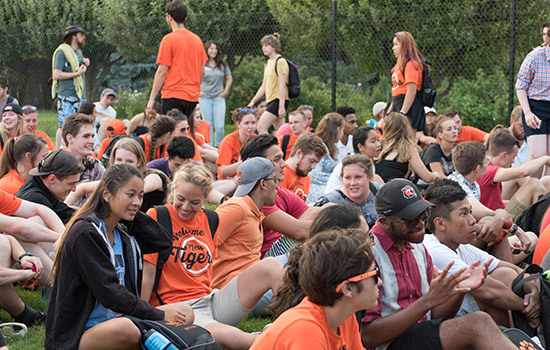 At 10:30 a.m. Wednesday, new students will participate in the Tiger Walk, as they are cheered on by RIT faculty, staff and parents when they enter Gordon Field House to attend the convocation starting at 11 a.m. It will be the first convocation with RIT’s new president, David Munson. And a family Ice Cream Sendoff is planned from 4 to 5 p.m. outside the Gene Polisseni Center. On Saturday, a Tiger Activities Gala will be held in the Gordon Field House from 1 to 4 p.m.; from 8 p.m. to midnight, the Brick Bash dance party will be held outside the Student Alumni Union (or inside the Al Davis Room if it is raining). And fireworks are scheduled for 9:30 p.m. Sunday.